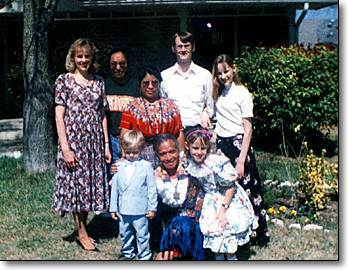 Allen Christenson, third from left in second row, with family and Maya friends. Allen Christenson has had an unusually varied preparation for his work as an art historian; a journey which takes in teaching, dentistry, Maya linguistics and shamanism! It may be in the blood, as he also has a brother who is deeply immersed in the shamanic culture of the Chumash Native American Indians and is an expert craftsman of Indian artifacts. Allen, meanwhile, is currently teaching as an assistant professor in the Humanities, Classics and Comparative Literature department of Brigham Young University, Provo. His new translation of the great K'iche'-Maya epic the Popol Vuh is about to be published by the Brigham Young University Press and his study of the Santiago Atitlan Altarpiece, Scaling the Mountain of the Ancients, is forthcoming from the University of Texas Press. Some years ago Linda Schele said to me, "You have to talk to Allen Christenson, he's the most outstanding student - he speaks K'iche', he's a trained Day-Keeper shaman and he's just doing brilliant work". So, of course, I did and we've been talking on and off since. As we're about to work together on a project and Mesoweb wanted some biographical details on Allen to go with his online presentation Weaving the Fabric of the Cosmos, I thought this was a good time to ask him some searching questions. AW... It seems a long way from dentist to Maya art historian - Is there a map for that? AC... I'm afraid you've started out with the forbidden "D" word. I actually started working in highland Guatemala while a lowly undergraduate student at Brigham Young University. I learned the K'iche'-Maya language while working as a health/literacy/etc. volunteer following the 1976 earthquake that devastated that country. When I returned after two years, BYU hired me to compile a dictionary and grammar in the K'iche' language. While working at this I also did research on Maya calendrics and shamanism, training with a number of ajq'ijab' in the areas around Momostenango, Totonicapan, and Cunen. The position was much more interesting than flipping burgers at Burger King, although it didn't pay as well. The university couldn't afford to fly me down so I made the trip on a series of buses from Provo to Guatemala City. Many of these held as many chickens, pigs, and turkeys as people. One very nice woman sat by me holding a turkey in a basket that pecked at my arm for 200 km until I was bleeding. It had always been my intention to work with the Maya for the rest of my life. There's nothing to compare with the people or the beauty of that place. Unfortunately, I also wanted to make a living and have a family. At the time I was told that there were very few opportunities in the field and that I should find a day job that paid a decent wage. I chose dentistry because in my family you were either a physician or a dentist. I didn't like dealing with life and death on a daily basis. Nor did I relish the idea of being on call all the time, so I chose dentistry. As soon as I made enough to pay off my debts, purchase a house, and a few toys, I got out (14 years if you count Dental School at UCLA). Nevertheless, I had continued to teach Art History and Humanities courses part-time while practicing dentistry. This included about 5 years at Merced College in California, and a little over two years at Brigham Young University. I finally decided that I would rather do what I love full time so I sold my practice and went back to graduate school at the University of Texas at Austin for my MA and PhD in Precolumbian Art History. AW... So I needn't ask you to extract my lower left incisor then. How did you come to study with Linda Schele at the University of Texas ? AC... I made the circuit of the major Art History programs in the U.S. that had Maya specialists on their faculty. Each involved an intimidating interview process, often across long polished tables with the portraits of imposing former deans glaring down. I would have gone anywhere that would take me I suppose, and I was convinced that I wanted to go to each of them in turn. Still, none had a particular interest in the living Maya as artists, which was my principal interest in the field. I had read Linda Schele's book "Forest of Kings," which she co-wrote with David Freidel, and was very impressed by the authors' recognition that the Maya are not just an ancient people. They stressed that the Maya continue to thrive in modern society and that our knowledge of the magnificent ancient cities and monuments of the Maya region may be informed by the beliefs and practices of their living descendants. Linda was teaching at the University of Texas, Austin, and I purposely left that interview for last. I felt that here was a kindred spirit - someone who not only knew Maya art and the intricacies of their ancient writing system, but who seemed to also understand the way the Maya think as fellow human beings. I'll never forget the first time I walked into that tiny office of hers piled high with what looked like a disorganized jumble of papers, boxes, computer paraphernalia, and off-color cartoons. I gave her a few examples of my writing, and after two pages she laid down the papers, looked me hard in the eye, and said, "This is where you belong." AW... How did her ideas and teaching methods affect your attitudes ? AC... Linda became my academic mentor, as faculty advisors should be. She also became an inspiration. At her funeral in 1998, Kent Reilly spoke for all of her students when he said that "Linda was not just a professor, she was a force of nature." She was tireless to the last. I think her greatest influence on me was to never stop questioning, and being excited about the answers. Despite the pain and weariness of her last months when she was dying of cancer, she never lost the sparkle in her eyes when one of her students suggested something she hadn't thought of before. I can't tell you how rare that is in an established scholar. I've never seen it before or since to the degree that she demonstrated it every day we had the honor of working with her. I miss her dearly. AW... Any idea what effect your ideas and insights might have had on the work Linda was doing ? AC...I don't know what influence I had on her. I know that she often asked me how the modern Maya look at particular questions of world view. As I was completing my dissertation work, she seemed to take great pleasure in seeing the work of the Chavez family of sculptors in Santiago Atitlan. I think it reaffirmed for her that Maya culture is not a dead entity - that after centuries of oppression and attempts at assimilation, the Maya still have the desire to create works of art that reflect their very unique view of the world. It was gratifying to her, I think, that she had helped to revive important aspects of the ancient world of the Maya through her writings and conferences - and that she could recognize much of this cultural heritage in the lives of the people I worked with. She insisted that I give to Nicolas Chavez an inscribed copy of one of her last books, "Hidden Faces of the Maya," with a brief message that I translated into Tz'utujil for her. She passed away before I could bring Nicolas' response back to her. AW... What made you chose this Guatemalan town of Santiago Atitlan for a doctoral dissertation? AC... I had actually intended to work with the K'iche's, because I already spoke their dialect of the Maya language. Also, I had prepared a new translation of the mythic portions of the Popol Vuh, which was written by anonymous K'iche' scribes in the sixteenth century. During the process of this translation, I found a number of intriguing questions that I would have liked to explore in my dissertation. Unfortunately, my training at U.T. was as an Art Historian, and the K'iche's do not emphasize visual images in their modern culture. The Tz'utujil of Santiago Atitlan are unique among the Maya of highland Guatemala for their painters and sculptors, many of whom stress traditional Maya themes in their work. This is not to suggest that they are Maya revivalists - artists and writers who try to resurrect a dead culture as a means of asserting their political identity. I found that artists like the Chavez brothers incorporated beliefs and ritual themes that were practiced in their community during their lifetimes. I first became acquainted with the altarpiece that became the focus of my doctoral work in 1977, at the very time when it was being reconstructed by the Chavez brothers. Although the violence of the 1980s prematurely halted the reconstruction, the altarpiece impressed me with its masterful blending of Roman Catholic and traditional Tz'utujil motifs. It is rare in the extreme to see these beliefs and rituals expressed sculpturally by living Maya artists, and I was intrigued by it. I still am. Nothing has ever been done like it before or since to my knowledge. AW... So do you see Santiago Atitlan as an epitome of the coming together of the ancient and the present? AC... I'm not sure I understand the question, but I believe that because of its unique history Santiago Atitlan had a better opportunity to maintain its Maya traditions than most communities in highland Guatemala. The conquest of the highland Maya was carried out in 1521 by Pedro de Alvarado, one of the principal captains who served under Hernan Cortes. When Alvarado first arrived, he encountered three major Maya nations that dominated the region - the K'iche's, the Kaqchikels, and the Tz'utujils. Alvarado made short work of the most powerful of these, the K'iche's by burning their capital city at Q'umarkaj to the ground and massacring its rulers. The Kaqchikels were the second great highland Maya kingdom. Although the Kaqchikels initially allied themselves with Alvarado out of hatred for the rival K'iche's, they soon came to regret their decision. Alvarado used their capital city for his own military camp, and demanded such high tribute payments that the inhabitants fled into the surrounding mountains. The Spaniards eventually lured the Kaqchikel rulers back, only to publicly execute them for failing to meet their demands for gold. The third great Maya power center belonged to the Tz'utujils, the people of Santiago Atitlan. Although Alvarado defeated them as well, the battle was brief and their well-protected capital city was left virtually untouched. The Tz'utujil rulers realized that it was in their best interest to appease the invaders so they offered submission and never rebelled. As a result, Alvarado allowed the Tz'utujil king to keep his throne and his family continued to rule the region relatively undisturbed for generations. Although early Christian missionaries established a monastery at Santiago Atitlan later in the century, they abandoned it after a few brief decades and the Tz'utujils were pretty much left to their own devices. I believe that it is this relative isolation that allowed traditional Maya religion and ceremonialism to flourish more openly at Santiago Atitlan when so many communities closer to Spanish centers of power abandoned the old ways or adapted them radically so as not to offend the Roman Catholic authorities. I do not however believe that Atitecos are relics of a long-dead past. They are a modern people, well-aware of the broader world around them. Although Protestantism and orthodox Roman Catholic worship are making great inroads in the community, there are still a significant number of traditionalists who maintain what they can of the ritual cycles observed by their ancestors in the past. The religion of these traditionalists is a dynamic blend of Christian and ancient Maya beliefs - one which is constantly changing from year to year as new theological, political, and economic pressures force them to adapt. What is fascinating about this hodge-podge of what we Westerners might consider hopelessly-conflicted ideas is that the traditionalist Maya are not troubled by the disparities. For the most part they, like their ancestors, choose what elements of Christianity to incorporate into their world view. If something in Christianity makes sense to them, they adopt it willingly and wholeheartedly. If some Christian idea does not resonate with their core beliefs, it is ignored. In the past, if a Catholic priest tried to get them to stop some of their "irregular" worship practices, traditionalist elders simply labelled him a Protestant (not a compliment) who didn't understand the true faith and had no authority to interfere with their business. AW... How and why did you come to see the Altarpiece as the central focus for your work? AC... I had originally intended to do a comparative study involving several highland Maya communities. Quite frankly I never found anything like the ambitious scale of this altarpiece. Nor are there other communities where the direct involvement of living Maya artists is documentable in the construction of a similar type of sculptural art. I think the real strength of this line of research lies not in my interpretations, but rather in the unprecedented degree to which the Maya artists involved were willing to discuss their work and their deeply-felt convictions openly with an outsider. The moment was right for the kind of interaction we enjoyed. I tried not to stray too far from their voices in my work because such an opportunity may not present itself again in the same way. AC...While doing linguistic and anthropologic work in Guatemala in the late 1970s, I worked with a number of ajq'ijab' ("daykeepers") in the communities around Momostenango and Totonicapan. In the course of our collaboration, we periodically broached subjects that they deemed too delicate for someone not trained in traditional highland Maya ceremonialism. One of those I worked with in particular felt that it was important that ritual prayers and other aspects of his religious heritage be preserved. He therefore offered to train me so that I would better understand his beliefs and record them accurately. AW... Is it possible to be a practitioner in such a very different cultural tradition? Or is it more to do with the individual than cultures? AC... I am obviously an outsider, and have no claim to understand what it is like to be a Maya in the modern world. Nevertheless, the Maya that I know are not the mysterious people that we Westerners sometimes make them out to be. They are part of the human family and as such we can see much of ourselves in them. One of the great events in the field of Maya studies is the International Maya Meetings at Austin, Texas, held annually in March. Linda Schele, who founded these meetings, insisted that along with the great academics and researchers in Maya studies, funds be made available to bring in Maya representatives as well. We as Westerners are fascinated by the gorgeous art, architecture, and literature of the ancient Maya. But it is not our cultural heritage, and the ancient scribes and artists who created it were really not speaking to us. Linda was adamant that her work and that of her colleagues must be shared with the Maya themselves as a simple matter of respect. When I was a graduate student at the University of Texas, the visiting Maya generally stayed at my home because of my language background. My wife and children looked forward to these visits all year. Not only do the Maya who came to stay with us represent a great cultural heritage, but they also enjoyed dancing the macarena on the sofa with my kids and beating me badly at chess. As terrible as the persecution of the Maya has been over the centuries, our ignorance of them as fellow human beings is perhaps just as terrible. Hopefully that particular wall of indifference and misunderstanding that separates our worlds won't stand much longer. AW... What additional insights has this special spiritual and cultural contact helped give you in your chosen field of art history? AC... I think that it's given me the insight to read a work of art, in much the same way that you would read a work of great literature. The visual arts are at least as much a legitimate form of societal communication as writing. At the same time, it communicates on a different level. The great American photographer Alfred Stieglitz cautioned people that you can't explain what a painting or photograph means. He suggested that if the artist could have put the same ideas into words, there would have been no need to paint it or photograph it. In the West, we are concerned with coming up with a definition for what art is. What a ludicrous question. It implies that we can distinguish the concept of art as an entity unto itself. We build museums to collect works of art so that people can visit on weekends and experience it as if it were separable from the "real" world. In my family growing up, art was something you hung on a wall to decorate the house. It embellished walls rather than being a practical part of the building. The Maya recognized the fundamental importance of art to their society and did not separate it from their everyday lives. They were intelligent enough to have never invented a single word equivalent to our concept of art. That is because everything is art - an expression of universal aesthetics. One of my favorite ancient Maya pieces is an incised bone from Burial 116 at Tikal, the tomb of the powerful king Hasaw Chan K'awil. It shows the gaping jaws of a serpent, symbolic of a portal into the world where the gods reside. Out of the serpent's mouth emerges a beautifully carved hand delicately holding a paintbrush. The gods themselves are artists. Maya painters, sculptors, scribes, weavers, and all the rest were to an extent engaging in a divine act, creating a reflection of the sacred world first conceived by deity. It is therefore part of the fabric of their world, just as integral to it as the sky, trees, and mountains. It's no wonder that artists held such a prominent and respected role in ancient Maya society. Many are known to have been members of the royal family. It's a shame that today many of our finest artists consider themselves to be outsiders, even disdainful of the uncultured masses. I think the ancient Maya would have been amazed at our seeming inability to produce great art that is relevant to modern society as a whole. In Santiago Atitlan, the Chavez brothers don't enjoy the same degree of notoriety as ancient Maya artists, but the altarpiece they helped to create is considered by Atiteco traditionalists to be an object imbued with divine power. The saints in its niches are not merely images of wood and cloth but living members of the community who are concerned with its problems. The same is true of the altarpiece itself which is conceived as a sacred mountain. It has what the Maya call a living k'u'x (heart) that both blesses the people of the community, and at the same time requires renewal through human agency. It is a part of the social fabric, not mere decoration. Weaving the Fabric of the Cosmos by Allen Christenson.